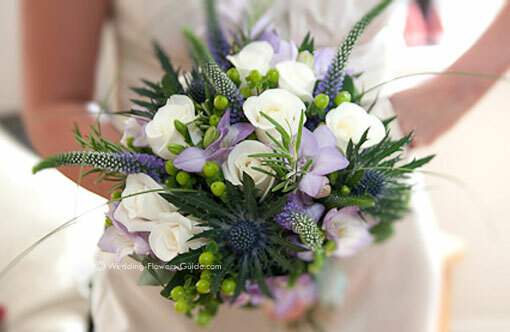 There is a huge choice when it comes to wedding flower bouquets. But how do you choose one to suit you? Here is a quick run-down of four popular styles of bridal bouquets. If you consider these before visiting your florist for a consultation, you are much more likely to have a constructive meeting and come away with flowers that will be perfect for you. Traditional shape, giving a simple elegant look. Suits flowers such as roses, tulips, rununculus and peonies. 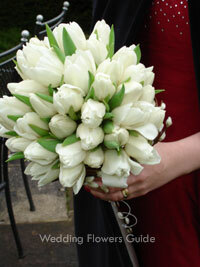 We've noticed hand-tied posy bouquets becoming more and more popular. Traditional teardrop shape, consisting of a posy with a trail of flowers and foliage. 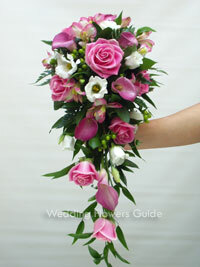 Long slender bouquet that is designed to be carried over one arm. 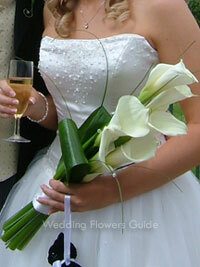 This is best suited to long stemmed flowers such as calla lilies (arum lilies), as seen in this photograph. These wedding flower bouquets are especially for the bride who wants to make a statement. They don't follow any set design and can be artistic, flamboyant as well as unique. So let your imagination run wild, or really put your florist's creative skills to the test. 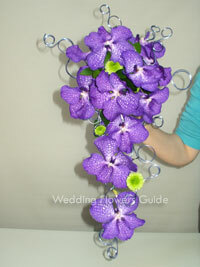 We created this bouquet using vanda orchids and made extensive use of decorative aluminium wire.